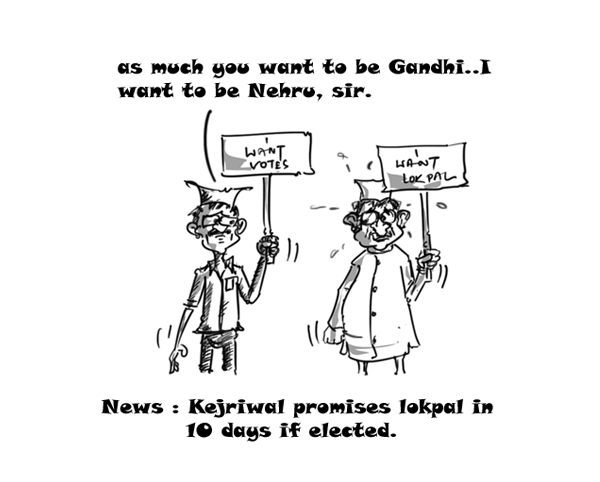 Kejriwal promises Lokpal in 10 days if elected ! Arvind Kejriwal, the x-Team Anna right hand promised Lokpal within 10 days if his party gets elected in upcoming elections and postponed the date of declaring his political party’s name by 26th November. Arvind Kejriwal-I’ve been forced to enter politics,it’s not my choice. After the split with Anna Arvind Kejriwal, who chose to enter politics to clean the ‘corruption’ led a protest at Jantar Mantar, against hike in power tariffs . Kejriwal took the opportunity to clear his stand on Anna and politics. He said,Anna just did not wish to enter into politics and he decided to do so to clean it up and that politics was not his choice but need of the moment. Well, the big guns of the politics , whom all this while Arvind has been verbally accusing , might be very happy to see him enter politics , a game which they have mastered well and may surely give Arvind Kejriwal a hard time in future ! All we can do is pray for his well being as the New Face in Indian Politics. The Ring-Master and his Rebel Trainee ! Modi says, for Congress,money grows on 2G and Coalgate trees! Mocking at , Prime Minister, Manmohan Singh’s speech, addressing the nation,stating money does not grow on trees, Gujarat Chief Minister, Narendra Modi said for Congress, money grows on 2G and coalgate trees(the scams exposed in recent past where involvement of Congress politicians has been sited). Mamata demands 24 LPG cylinders at subsidized rate,per year ! Mamata Banerjee has successfully managed to shaken the UPA govt and her demand for 24 subsidized LPG cylinders per annum , has forced the central govt to increase the number to 9 per year which may again be revised to a bigger figure.